...something like this I mean so you know right.Also the same I wanna do with sites where I need to login with my login datas without to confirm any messagebox which you normaly get in browser etc.So the question is how I could do this?Maybe you could help again. 2) InternetOpen + InternetConnect + HttpOpenRequest + HttpSendRequest + InternetReadFile. Yes, it's slightly more complicated, but InternetConnect allows you to specify user/pass. Hi,I got a way in my app,but I am not sure it works in your situation. Hope it can help you a little. Using this method however, you have to write the headers and all that jazz yourself. The higher level functions of wininet do that for you though. thanks for your informations about what APIs I need to check & exsample. So now I need to study this API description etc so I never used any internet API before. Question: So I see I get already some problems with the API parameter NAMES XY as "PRE_CONFIG_INTERNET_ACCESS" etc so I can't push these as name in Olly so for these paramater I need the push values as 100 for exsample.How can I handle this problem without to use WinASM itself? Also I didn't work a long time no more with WinASM but if I remember right then I need to add a wininet.lib for right?Hmmmm! Ok listen.Do you have or know any exsample exe files already which I could check?Or maybe you could create any simple one how does access any site (google etc) and does read the source.Just only a question of course before I test endless to find the right values xy for some parameter names you know. EDIT: Good ok Encrypto but also I have no ideas about winsock etc.VB stuff right?So all in all I am just looking for any simple solution to access any internet site + reading source code of this site into memory and thats all already.So I don't wanna do it manually and thats the reason why I am looking for a nice & lazy way. LCF, the appropriate values are defined within the header files (wininet.h and similar), just include them in WinAsm. And yes, you'll also have to link the library. That's as lazy as it gets. ok I got it now a little bit to create a project in WinASM.All working so far as I imagine at the moment but I have one problem.So I also use the InternetQueryDataAvailable API but there I get not the right lenght value back!Just get a smaller size back and not the full size of the source.....why? ....so at the moment I can just read the entire source blind (alloc 100000 bytes in the hope that the source is not larger).Of course its a bad solution for this but maybe you know what the problem is in my case above. Hi, sorry for a later resp. This function returns the number of bytes of data that are available to be read immediately by a subsequent call to InternetReadFile. If there is currently no data available and the end of the file has not been reached, the request waits until data becomes available. The amount of data remaining will not be recalculated until all available data indicated by the call to InternetQueryDataAvailable is read. 3. For now,do you need any example ? If you have a file and size's 1GB, do you have a free memory to cache that big file ? So I choose a loop to read the available size till its end. ok but how to make a loop with InternetQueryDataAvailable API to get the entire size of the source of any site?So I have test a little bit with different sites I for some sites I get the full source size back and for other sites not also if they have a smaller source size so thats a little bit strange.Thats the reason why I now use a reading size of 100000h bytes to be sure to get the full source size without to use the InternetQueryDataAvailable API. So yesterday I made got already some success with my test app to read the source / find strings xy + export them into log file. So now I have a another question about searching text strings into source.So how can I do this in the best and simplest way?Just imagine I have load the full source in memory and now I wanna check for some ASCII strings inside and to log the data which comes right after the strings. But this is not so good so I dont wanna always check for opcodes.So I wanna do directly with the strings to find them but how and what API can I use for this?Lets say I have a text source size of 1000h bytes and somewhere inside are these strings to find and now I wanna check this source only one time to find all of them without to know where the strings starts.Normaly I could use commands as "REPE CMPS BYTE PTR ES:[EDI],BYTE PTR DS:[ESI]" etc but for this I need first to find the string start to compare it then but this method I don't like. So I am looking for a API like this..
push string to find pointer = ASCII "ABCD"
...but I dont remember any API who could to this etc.So at the other hand I could use the API CompareString but then I have to call this API for each byte (no idea whether this is good or bad because performance speed etc). Ok so I think there is no big different if I use opcode check as strings or compare APIs about the speed.So now I use this compare API. PS: I also see that I have no API parameter to choose for the CompareString API in WInASM. So I cant choose NORM_IGNORECASE for exsample so I get nothing I can just enter this manually!=?But why?Kernel lib & inc are in the header above.Strange. 2. find string for opcodes,it is better using strstr command. ...for exsample which is the end of page source in my case.This is bad again so I don't wanna add tons of extra checks just because the API xy is not working correctly or whatever you know.Hmmm!Also note that I don't know the page source size of course which also gets updated each time.What now? So I think the API comparestring is ok so far for me.Seems to work without problems & good speed but thanks for the strstr exsample. Thanks again and maybe you have a solution for this size problem what I have and why the API does not work as it should (right?). I have test the part of "InternetQueryDataAvailable", not quiet as good as I described, sorry. this time I create a sample and the source code is below. So you can translate it to asm. thanks for your exsample file but I can't load / run it so there is any msvcr110.dll & msvcp110.dll problem for me (FlsGetValue not found in kernel32).I use XP so maybe you can compile it again. But also with your exsample code the API just reads always just 296 bytes via InternetQueryDataAvailable but the site xy has some 1000 bytes.Hmmmmm! Listen: The manually way is so simple....enter link xy in browser / press strg+U (open source page) / copy entire site to text file = Done. No idea why the APIs have again any trouble to do this correctly so maybe you know any other way which could work better without problems etc. EDIT: Ok wait....so can I also just repeat the InternetReadFile again & again till lpdwNumberOfByteRead is set to 00?So I have test it a little and this could or seems to work so after a few times the bytes getting more and then it will set to 00 but now I have the entire source into. I have a another question about the InternetOpenUrl API.So I see this API need always some little time (2-3 seconds) each time if I call any link.So is there a way to call this API faster etc?So the problem is that I have to call very much links (500 and later much more) and for each link I have to use this InternetOpenUrl API which takes a long time.So what can I do in this case to make it faster etc?So at my test app I did grab 500 links and the app dose need 5-6 minutes till it has checked them all.Thats not so good. Hmmm. and each site I have to check for strings xy (if found on site then log to file later).Maybe you have any idea whether its needed to call each time the InternetOpenUrl or not or you have any other ideas etc. If you do not need to post any data to the url, you could connect to the url manually using raw sockets. Which should remove some of the overhead created by the InternetXXX functions. However you will still have the delay of the page loading on your connection speed regardless of what API you use. So there is going to be some delay no matter what. You need M.S visual C++ runtime library 2012 ,just install it, about 1.68 MB. Of course, you can just delete that part and just use InternetReadFile to read source and dwSize set to a large number till lpdwNumberOfByteRead is 0.
em,I have no idea with it, in my case, each time it takes about 400 ms.
good ok so it seems that I have to live with the delay issue of InternetOpenUrl API. Also I have no ideas about raw sockets etc (VB stuff right? ).Are these working faster anyhow?So as I said I only want to read the page sources. So I have already the msvcr110.dll & msvcp110.dll.Anyway,so can you post a link where to download this pack on ms? Yes so I think only to use the InternetReadFile API in a loop till lpdwNumberOfByteRead is set 0 seems to be the better solution instead to use InternetQueryDataAvailable API. No idea why InternetOpenUrl takes so long time in my case. My internet connection is 1.1 MB/s download.Maybe its to less and you have any higher download speed. Ok thanks again for your help guys. Yes, InternetReadFile is better . ...anyway so then I just keep to use InternetReadFile only to get all datas. EDIT: One question.So why I always get a ERROR_INVALID_HANDLE after using InternetCloseHandle API? em, I aware that there is something "wrong" with InternetQueryDataAvailable before posting when the first time I use that api to get available size, I also had checked it by google and found several topics poster with the same problem,but forgotten the solution. Found dwError is always 0. Hehe again any strange API issue right. Anyway so I don't use this API anymore if the other way (read API) does also work in a loop. About InternetCloseHandle API.So what is the problem now with this API?So I also get always a (ERROR_INVALID_HANDLE (00000006) back but in eax is also value 1 = succes right? The handle that was passed to the API has been either invalidated or closed. InternetCloseHandle = ERROR_INVALID_HANDLE for both handles of InternetOpenA & InternetOpenUrlA API.So if I don't use the InternetReadFile API and call direct the two InternetCloseHandle APIs then I get a success for both.So it seems that there should be any another API (InternetCloseFile maybe etc no idea) to use before or? ...but the question is why it fails?Do you know the reason and how to fix it etc? Hi its me again so I forgot something to ask before about a new problem I have. So this I get now into my tex file each line any word.But I wanna export it in that way..
...but how to handle this?Maybe you know also a simple solution for this (APIs / codes / whatever can help).Sorry for asking again but "correctness must be"
Have you checked the sample ? Does it always get ERROR_INVALID_HANDLE when calling InternetCloseHandle ? I have checked the source code again,and found no problem. MSDN remarks Returns TRUE if the handle is successfully closed, or FALSE otherwise. The function terminates any pending operations on the handle and discards any outstanding data. If a thread is blocking a call to Wininet.dll, another thread in the application can call InternetCloseHandle on the Internet handle being used by the first thread to cancel the operation and unblock the first thread. If there is a status callback registered for the handle being closed and the handle was created with a non-NULL context value, an INTERNET_STATUS_HANDLE_CLOSING callback will be made. 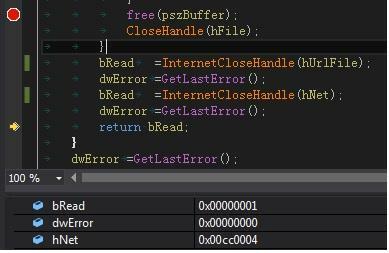 This indication will be the last callback made from a handle and indicates that the handle is being destroyed. If asynchronous requests are pending for the handle or any of its child handles, the handle cannot be closed immediately, but it will be invalidated. Any new requests attempted using the handle will return with an ERROR_INVALID_HANDLE notification. The asynchronous requests will complete with INTERNET_STATUS_REQUEST_COMPLETE. Applications must be prepared to receive any INTERNET_STATUS_REQUEST_COMPLETE indications on the handle before the final INTERNET_STATUS_HANDLE_CLOSING indication is made, which indicates that the handle is completely closed. An application can call GetLastError to determine if requests are pending. If GetLastError returns ERROR_IO_PENDING, there were outstanding requests when the handle was closed. About string sort. Here is my solution,and tests good. yes I have checked your file you have send to me before "Example.exe" and there I get also 2 times a " LastErr ERROR_INVALID_HANDLE (00000006)" after stepping over InternetCloseHandle API..below the VAs of your file.Just load it into Olly and set a BP on it and then step and check what you get.Just check this in Olly to see whether you get the same trouble. About your new sort file....so I still have again any problem with this file to get it run so Windows tells me that the file is not a valid 32 file.So it seems that I also for this new file need any system add-on which I don't have installed yet.So what do I need now again? So can I use your source code also in WinASM?I don't think so or?